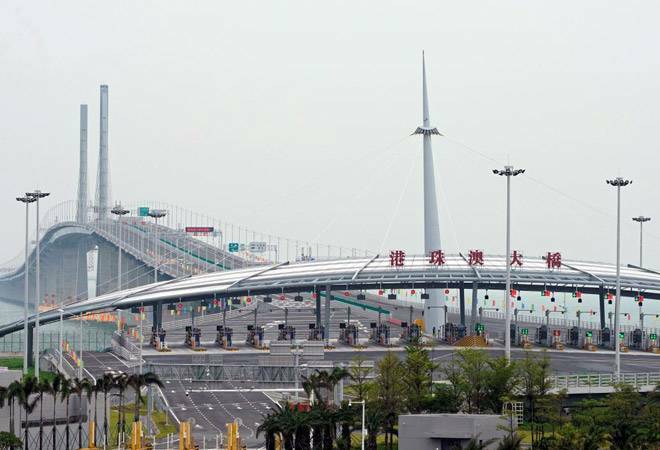 China opened the world's longest sea-crossing bridge and tunnel on Tuesday, linking the financial centre of Hong Kong, the gambling hub of Macau and western reaches of the Pearl River Delta at the heart of southern China's economic boom. The Hong Kong-Zhuhai-Macau bridge is made up of nearly 35-km (22-mile) of bridge and road sections, and a 6.7 km (4-mile) tunnel between artificial islands to allow shipping to pass unhindered. President Xi Jinping presided over the inauguration early on Tuesday but said little except to declare the bridge officially open to a burst of fireworks projected onto a screen behind him. Vice premier Han Zheng said the bridge would help drive China's strategic blueprint for a "Greater Bay Area" around the Pearl River Delta modelled on other global economic dynamos like San Francisco Bay and Tokyo Bay. "Standing at this new historical starting point, we firmly believe that the opening of the bridge will further develop the special advantage of Hong Kong and Macau," Han said in a speech at the ceremony. The bridge, which snakes across the Pearl River Delta from Hong Kong's Lantau island and passes Macau's glitzy casinos, will begin operations on Wednesday when some bus services begin. Arrangements are being finalised for trucks and private vehicles will need special permits to use it. According to Chinese media, authorities will use facial recognition systems to detect yawning drivers on the bridge, as a safety measure. If a driver yawns three times, an alarm will go off, media has reported. Hong Kong authorities have defended the bridge's HK$120 billion ($15.31 billion) price tag, saying it would consolidate Hong Kong's position as a regional aviation and logistics hub. Some critics, however, see the bridge as a white elephant that is part of a multi-pronged push by China to exert greater control over Hong Kong, which returned from British to Chinese rule in 1997 amid promises to preserve the city's high degree of autonomy and individual freedoms denied in mainland China. The bridge was first proposed in the late 1980s, but it was opposed at the time by Hong Kong's British colonial government, which was wary of development that might draw the city closer to Communist China. The bridge's opening comes at a challenging time for China as it faces pressure from a trade war with the United States, volatile financial markets, mounting public debt and a slowing economy. President Xi's visit to the southern economic powerhouse of Guangdong had been shrouded in secrecy, with state media making little mention of his itinerary before he showed up for the bridge opening. Some media commentators have seen Xi's trip to Guangdong as an opportunity for Beijing to reaffirm its commitment to economic liberalisation. Some point to the apparent symbolism of his visit to the crucible of China's boom on the 40th anniversary of the launch of its reforms, when it began a transformation from a centrally planned to a market-driven economy with Chinese characteristics. Xi has come under fire from some businessmen and analysts for his state-centred approach to economic policy and his focus on stability, rather than proactively pushing market liberalisation. He said last month, however, that China was still determined to reform and wanted to work with all parties to build an open world economy. He said on Sunday the ruling Communist Party would always support private firms' development, and any acts to weaken the private economy were wrong, according to the official Xinhua news agency. Some Hong Kong media have dubbed Xi's trip, his second to Guangdong since taking office in 2012, as a "southern tour", echoing a high-profile 1992 visit to the special economic zones of the south by former paramount leader Deng Xiaoping. Deng's trip helped reaffirm China's commitment to reform after the international condemnation following the 1989 killings of protesters in and around Beijing's Tiananmen Square. A senior Western diplomat said Xi's southern tour was an opportunity for him to say something significant on economic and market reforms, and to re-affirm Deng's legacy, noting that Xi had displayed "very little evidence of that" in recent years.